Paris: Éditions Payot & Rivages, 1993. This is the first French edition of Leaphorn & Chee: Three Classic Mysteries, published in 1993 by the French publishing house Rivages in Paris, France. Tony Hillerman's original English text was translated into French by Danièle and Pierre Bondil. This anthology includes three novels featuring Joe Leaphorn and Jim Chee collaborating in order to solve crimes in Tony Hillerman's Navajo Mystery Series, including: Skinwalkers (1986), A Thief of Time (1988), and Talking God (1989). The photograph on the cover is credited to D.R. 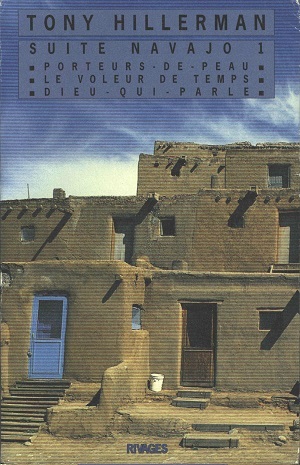 and features a tinted and grainy photograph of Taos Pueblo. Format: Paperback, 21 x 13.5 cm. Binding: Multicolored paper covers with the author, titles, and publisher printed in black on the spine.